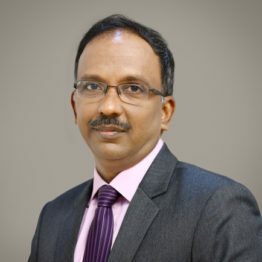 Dr. K Ramesh is senior consultant urologist and Robotic surgeon at Apollo hospitals, Chennai, India. Dr. K Ramesh completed his medical school and post graduation in general surgery from Kilpauk medical college, Chennai. He has completed his super specialty training in urology from Apollo hospitals, Chennai. He then travelled widely for further training in urology to United Kingdom, Ireland, Singapore and New Zealand. Having acquired extensive training in various procedures in urology, Dr. K Ramesh joined Apollo hospitals, Chennai since 2007. He had further training in Robotic surgery at Roswell Park Cancer Institute, Buffalo, United States. He is one of the few urologists who had certified and accredited training in Laser prostatectomy and other laser procedures in urology from Maidstone Hospital, Kent, United Kingdom. Dr. K Ramesh takes part in many academic activities related to urology. He is a teaching faculty in Super specialty training in Urology in Apollo hospitals, Chennai accredited by National Board of Examination, New Delhi. He is also a teaching faculty for Apollo MEDI skills Courses conducted by Tamil Nadu Dr. MGR Medical University, at Apollo hospitals, Chennai. He has presented various scientific papers in National and International urology conferences. He has published many scientific papers in urology in peer reviewed urology journals. He has also contributed to a book chapter-Robotic repair of Vesico-Vaginal Fistula in Practical Approach to Robotic surgery.